Health care professionals have access to a number of powerful highly addictive medications that can be easily abused, if one chooses to do so. Having narcotics in one's reach can quickly become a slippery slope as is evident by the number of doctors and prescribing nurses who end up seeking addiction treatment for one or many different medications combined. The anesthesia drug propofol is on the rise for abuse among health care professionals, a new study suggests. A number of health care professionals treated for abuse of the drug has increased steadily, the Star Tribune reports. Most began using propofol to get to sleep and became addicted over a short period of time according to the study. 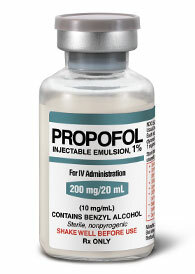 Propofol is normally used for surgical procedures because it takes effect quickly and is known to have a fast recovery time with fewer side effects than other anesthetics, the article notes. Data from an addiction center specializing in substance abuse among health care professionals was analyzed and researchers found 22 patients treated for propofol abuse between 1990 and 2010. Most of the doctors and all of the nurses were anesthesia providers. Most of those treated had depression, in addition to a history of childhood sexual or physical abuse. A number of patients had family members with schizophrenia. The study will appear in the April issue of the Journal of Addiction Medicine.